A high school rodeo athlete rides a bull at the 2013 Nebraska High School Finals Rodeo. The Orthopaedic and Spine Center of the Rockies is on site at the state finals to help athletes with preventative care and if injuries should happen during a ride. Photo by Ken Stein. Rodeo is a tough sport. 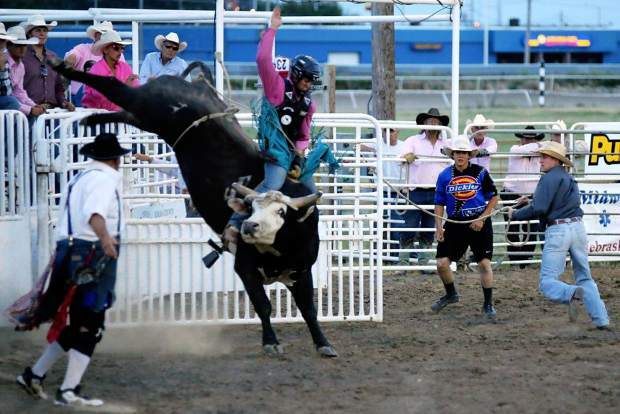 Matching up with bulls or broncs that weigh more than a thousand pounds, or jumping off a horse to wrestle a steer to the ground can cause injuries. But the Orthopaedic and Spine Center of the Rockies helps rodeo athletes prevent and treat those injuries. For the past twenty years, the Center, with clinics in Ft. Collins and Loveland, Colo., has come to the Nebraska State High School Finals Rodeo, offering their services to high school rodeo athletes as they compete. Rodeo athletes are able to come in prior to competition and visit with a certified athletic trainer, get taped up, get a little advice about how to care for a nagging injury, then after they've competed, come back to the mobile unit for more treatment and advice. If a serious injury occurs, trainers can refer the athlete to a doctor and suggest treatment. It's a nice thing to have for the kids, says Julie Clark, a mother of a high school rodeo athlete and two college rodeo competitors from Wellfleet. Her sons Wyatt, 23, and Jaden, 19, have both visited the Center's mobile unit at college rodeos, and Wyatt used them for high school rodeo. Wyatt had a broken ankle and wrist and shoulder injuries from rodeo. The best thing the Center offers, Julie thinks, is that they understand rodeo. "They're so knowledgeable with rodeo," she said. "The biggest thing, for Wyatt, was he felt they have his best interests in mind because they really understand rodeo injuries." The Center takes its mobile unit to high school, college, and pro rodeos across Nebraska, Colorado and Wyoming. It covers forty to fifty rodeos a year, and is at the Wyoming and Colorado State High School Finals. The mobile unit also covers other sports, such as youth soccer and football games. Ryan Ostapovich, certificated athletic trainer, manned the Nebraska high school finals in 2012 and will return this year. He enjoys it, and knows it's benefitting the students. "It's a really good thing, especially for the high impact and higher risk sports like rodeo. There aren't many times in soccer that you get a horn in your chin from a steer. We love treating the athletes, and it makes us all feel good when we are able to show up and take care of the athletes." There is no charge for students to use the Center's mobile unit at a rodeo. It's something the Center does for good will. "It's about giving back," Ostapovich said. "It's important to be in the community, and we're fortunate enough to be able to do that." With many of the Nebraska high school rodeo athletes from western Nebraska, and small towns with no sports medicine clinics, many of them become patients of the Center. "Some of the towns these athletes come from don't have a big orthopaedic clinic," Ostapovich said. "If we can help them on site, it does feel good." And for the moms cheering their kids on, the Orthopaedic Center's unit gives them some comfort. "As a mom, it's very reassuring to know they're providing services," Clark said. The Nebraska State High School Finals Rodeo will be at the Adams Co. Fairgrounds in Hastings June 19-21. The first go-round will be at 10 a.m. and 6 p.m. on June 19; the second go-round is at 10 a.m. and 6 p.m. on June 20. The short go-round, determining the top four contestants in each event that will qualify for the National High School Finals, will be at 1 p.m. on June 21. For more information, visit AdamsCountyFairgrounds.com or call 402-462.3247.